This versatile milk chocolate M&M's® mini baking bits topping makes an excellent addition to any ice cream shop or bakery. 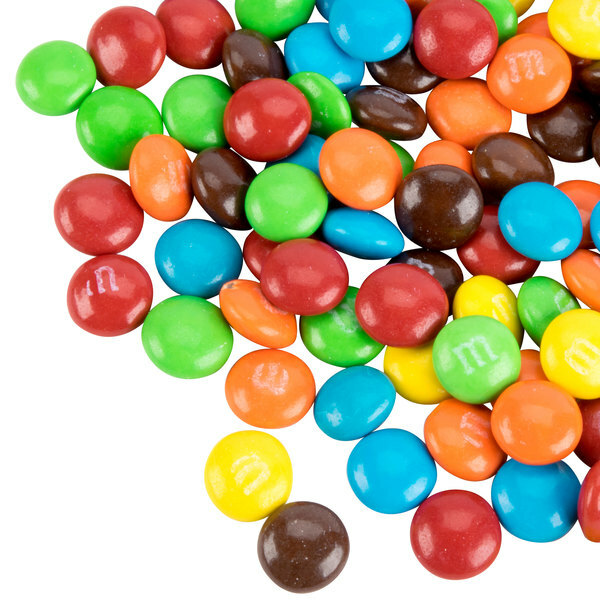 M&M's® combine a rich and creamy milk chocolate center with a crunchy, candy-coated shell. The assortment of colors makes these mini candy pieces a petite yet eye-catching treat. Sprinkle a spoonful atop a dish of soft serve ice cream, or use them to top candy apples. Whether you're creating decadent ice cream sundaes or other sweet treats, you'll find plenty of uses for this bulk supply of M&M's® mini baking bits topping. Blend it into your cookie batter, or use it as a sweet garnish for frosted cupcakes. Include it in your self serve ice cream or frozen yogurt bar, and your customers will love choosing their favorite toppings. 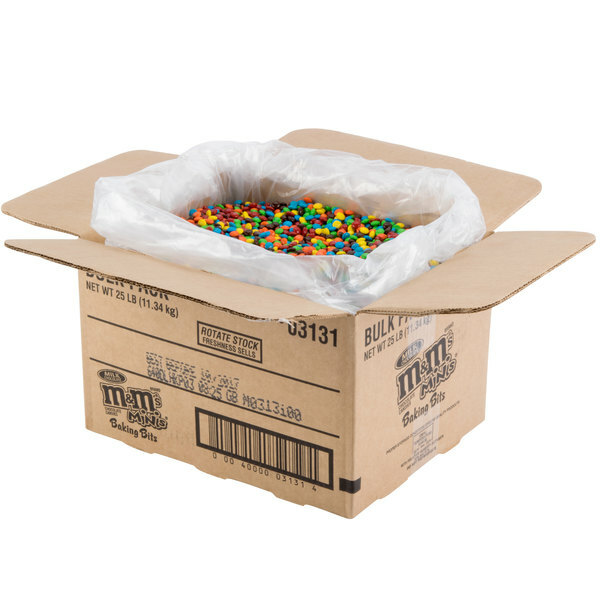 Stock your business with the best-tasting toppings, including this M&M's® mini baking bits topping. Overall User Rating: Milk Chocolate M&M's® Mini Baking Bits Topping - 25 lb. Highly recommend the Mini Baking Bits over the bigger sized., as they are easier for our kids to eat and also easier to bake! Wonderful taste as you would expect and fresh straight out of the package. Milk Chocolate M and M's are a really great buy. We cater and create custom candy tables and our clients love these mini chocolates to add to their candy station. Amazing taste, great addition to our topping selection. Everyone's favorite for sure. High quality and great packaging. Highly recommended whoever is looking for a fun and delicious treat. Exactly as described shipped and packed very well in a box with a sealed bag inside. 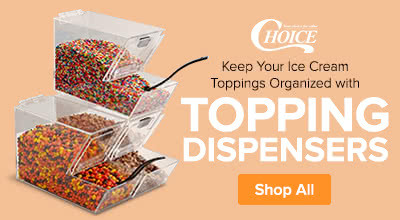 We use them for toppings at our ice cream shop and kids (and adults) love them! These are great minis. They have vibrant colored coatings, & a great taste. They work well in a variety of applications. They are good as toppings, coatings & mix-ins. Mini M&Ms are the perfect addition to ice cream and other desserts or even just eaten on their own. We've used them on cakes and cookies. These M&M's are delicious and both kids and adults love them as a topping on their ice cream. They are one our top 3 toppings sold. thee have been a hit in our store. Great bulk buy on mini M&Ms and they are packaged wonderfully. A great candy for our store and crowd favorite item. They are very good and store well. These mini M&Ms arrived packaged nicely... bagged and in their own box. I had ordered during the hottest part of summer and they arrived intact and not melted at all. They packed with an ice pack and a special box to keep cool. The mm baking bits are excellent and perfect for making our M&M truffle bites. The candy is fresh and so good to snack on too. 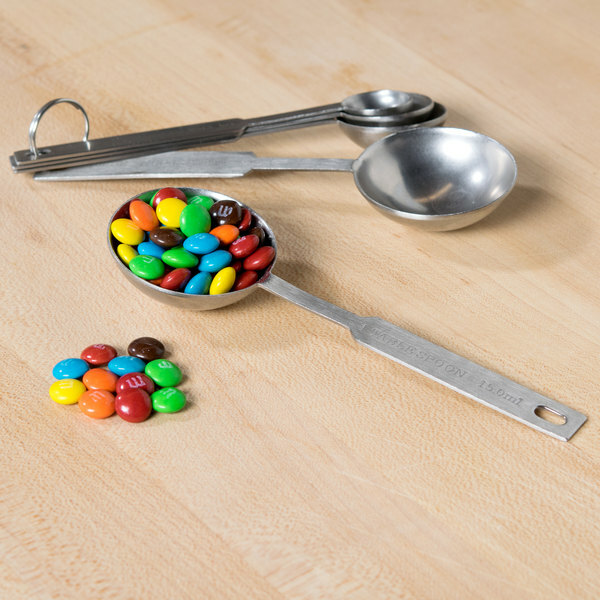 The Milk Chocolate M&M's Mini Baking Bits Topping - 5 lb. arrived promptly and was well packaged. The quality of the M&M's was tasty. We would recommend it. These M&M's are perfect for baking and as ice cream toppings. I highly recommend this product to anyone needing a bulk amount of M&M's for any occasion. These Mini M&Ms are the perfect size for the treats we sell at our store. From gourmet caramel apples to chocolate covered oreos the M&Ms are a great addition. 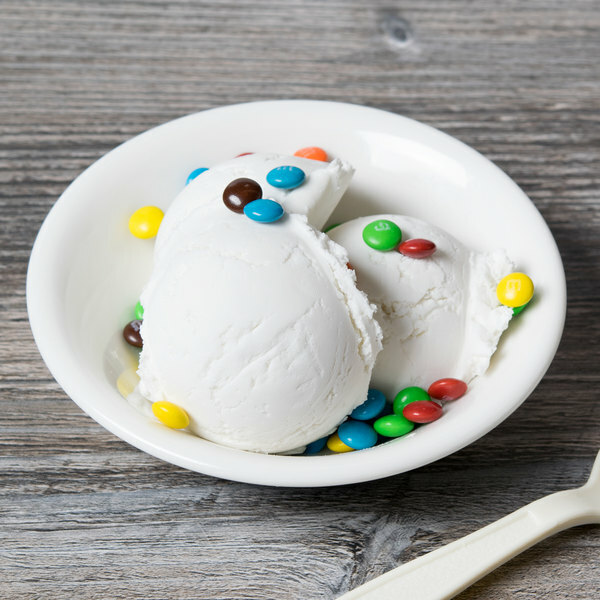 Mini M&Ms are a popular ice cream topping. I think it’s more fun to have the small ones instead of the bigger ones – people seem to like them. These mini M&M baking bits are great and make lovely add ins to some of our specialty bagels. Great quality and love the different colors. Regular sized m&m's are great for popping into your mouth, but there's just something about the mini m&m's when used in baking or as an ice cream toppings that make them so much better! also come fresh shipped. I have both kinds of M&M's on my frozen yogurt topping bar. You get so many of these and the price is really not that bad.